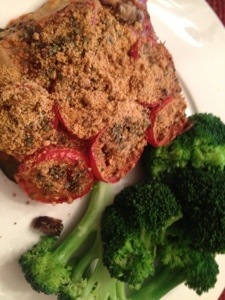 Tonight Julianne put together a fabulously fat free dinner that was tasty, filling and amazing. 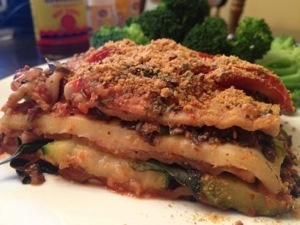 Called Grilled Zucchini Lasagna, it was made with zucchini, a healthy portion of fresh basil, whole wheat lasagna noodles, a sauce made from red peppers (no tomatoes) and Italian seasonings, and had mushrooms and bell peppers as well. It was topped with Roma tomatoes and a substitute Parmesan cheese made from cashews, nutritional yeast and some garlic powder. Man oh man was it good!! When I have an awesome dinner like this I forget about my cravings for Fazoli’s or other Italian food. This was to die for!! Compliments to the chef!! Julianne put in a lot of time and love on this one and she knocked it out of the park! !